The Brittle or Serpent Stars are grouped as the Class Ophiuroidea, characterized by having highly mobile arms that can be used to assist in (relatively) rapid motion. These starfish-like echinoderms are decidedly quicker and more delicate than asteroids. Their common name is derived from their sinuous, snake-like movements, and the fact that they're truly brittle and break away easily if they come under attack. The podia in this class are generally used as sensory organs, rather than for active feeding as with their kin, the asteroids. There are more than 2,000 described species worldwide, and they're found congregating throughout shallow reef environments, hiding under rocks and within and between other living organisms. Seemingly on the other end of the machismo scale are the Brittle or Serpent Stars, which are so retiring and nocturnal that you may never see them in your system. In the world's reefs, they are everywhere. 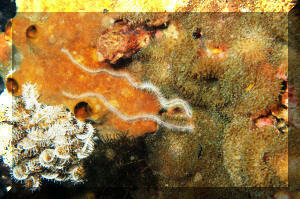 Two examples showing Ophiuroids tell-tale arms coming out and over soft coral in Bunaken, Indonesia, and a sponge in the Fiji. Many reef aquarists have grown fond of them, as they diligently work the underside and unseen recesses of the captive reef, scurrying around under the ledges and rocks, eating detritus. They can play an important role in keeping inaccessible areas of your tank cleaned up, and they stir up and aerate the sand bed where the aquarist can't reach. They are literally and actually everywhere in marine environments. If you look closely, especially by dark of night, you will find Ophiuroids lurking and feeding about. Here are some Brittlestar arms sampling the mud about its borrowed hole/home in shallow water muck in N. Sulawesi. Beware the Midnight Fish Eater! One species in common use warrants a statutory warning. 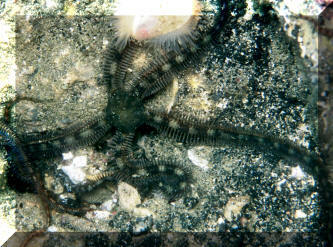 This is the Green Brittle Star of the genus Ophiarachna. This animal is a predatory fish eater, that does indeed do a spiffy janitorial job when small... but grows quickly, and under darkness of night can/does learn to eat aquarium fishes. This species has been documented to arch up in "sleeping caves" of captive fishes and drop down on unsuspecting meals. If you use this species, keep an eye on it, and a count on your piscine livestock. Green Brittle Stars at a wholesalers. This is one way to keep them from eating your fishes! A foot wide individual on the prowl! A retailers tank that has just had some fish-food water applied to it. For the appropriately small Brittle/Serpent Star species, selection is simple, placing healthy individuals at about one per ten gallons of your systems capacity. 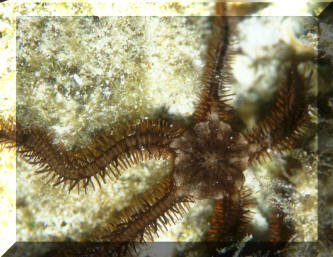 You may be fortunate to "inherit" your Brittle Stars with live rock, or collect them. For those near or traveling to the tropical west Atlantic, the genera Ophionereis, Ophioderma and Ophiocoma can be found in good numbers intertidally by carefully lifting rocks and using a hand net to collect a few. Of course, you'll need to study up and prepare for the captives intermediate needs, as well as comply with local ordinances, licensing. Ophioderma ensiferum, the Gaudy Brittle Star, in an aquarium. 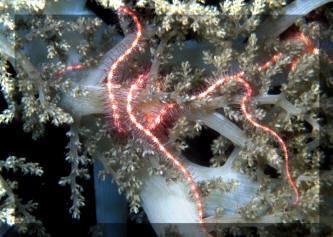 Ophioderma rubicundum, the Ruby Brittle Star in St. Lucia out at night. A whole tank of Ruby Brittle Stars awaiting shipping at a L.A. wholesaler's. Ophiocoma alexandri Lyman 1860, Alexander's Brittle Star. Indo-Pacific. Disc size to 0.9 in., arms to 7.1 inches in length. Feed on detritus both day and night by extending their arms from crevices, beneath rocks. Southern California to Peru, including the Galapagos Islands. Galapagos pic. 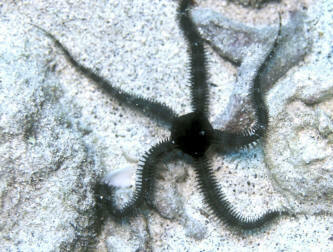 Ophiocoma erinaceus Muller & Troschel 1842, the Spiny Brittle Star. Indo-Pacific. To 5.5 inches in diameter. Dark by day, grayish bands by night. Found in association with living corals. Hawai'i' pic at night. 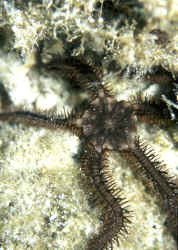 Ophiocoma paucigranulata, the Spiny Brittle Star. Tropical West Atlantic. 4-6 inches in diameter. Have pale colored arms in their middles. Found in association with living corals. Cozumel image at night. Ophiomastix variabilis Koehler 1905. Black bodied with long arms. All intermittently marked with yellow. Arms bear some paddle like structures as modified spines. Found on living corals in shallow water. Indo-West Pacific; Mozambique to Noumea. N. Sulawesi pic. Ophiopsila riisei Crevice Brittlestar. Thin arms, small spines... Light color banding. Generally only seen at night. Roatan 2019 (at night). Ophiotheia danae (Verrill 1869). Order Ophiurae, family Ophiotrichidae. Indo-West Pacific; Red Sea, eastern Africa to the South Pacific, Japan. Narrow armed sponges, gorgonians and soft corals are substrates for this diminutive Brittle Star. Banded arms come in blues, orange, red, yellow. This image made in Pulau Redang, Malaysia on a sponge. Ophiothrix purpurea Martens 1867. Reddish disk, alternating colors on arms, with a distinctive black stripe running down the middle of each one, surrounded by yellow. KBR, Lembeh, N. Sulawesi, Indo. image. Ophiothrix suensonii, the Sponge Brittle Star. Tropical West Atlantic. 2 1/2- 3 1/2". Live principally on sponges. Also found on fire coral and gorgonians. Arms bear a dark line running down their mid-line. Cozumel pix. 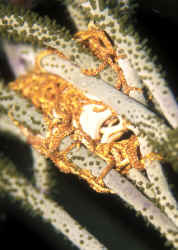 Ophiothrix sp. 2. Similar to O. purpurea, but with maroon spots in the middle of leg segments. Indonesia. Here climbing over a toadstool soft coral at night in N. Sulawesi. Amphiurids; here in S. Leyte 2013 in abundance. One fast mention of the bizarre Basket Stars. Though some folks have reported reasonable success in their husbandry (see references below), these nocturnal animals are by no means easy to keep in captive conditions. They require specialized, large facilities, and diligence in their food preparation and administration. The Basket Star Astrophyton muricatum in the Bahamas. Here "sleeping" by day on a gorgonian. The same species in a typical daytime spot; curled up inside a brown sponge. This one in Belize. Night time, and it's time to unfurl your arms into the incoming current and strain out your meal. Here in St. Lucia. http://home.att.net/~ophiuroid Damone, Joe. 1999. The Caribbean Basket Starfish (Astrophyton muricatum) in the home aquarium: is it possible? Aquarium Frontiers Online 2/99. Volkart, Bill. 1989. The beautiful Brittlestars. TFH 1/89.